The 2011–12 Ligue 2 season was the 73rd since its establishment. The previous season's champions was Evian. The league schedule was announced on 31 March 2011 and the fixtures were determined on 10 June. The season began on 29 July and ended on 18 May 2012. The winter break was in effect from 21 December to 14 January. Bastia clinched the second division title on 1 May 2012 with three matches to spare after defeating Metz 3–0 at the Stade Armand Cesari. The title is the club's second overall in the division having won the league previously in the 1967–68 season. Bastia will be making its return to the first division after a seven-year absence and will be entering Ligue 1 on a run of two consecutive promotions. The club had earned promotion to Ligue 2 after winning the 2010–11 edition of the Championnat National. Reims and Troyes became the second and third club, respectively, to earn promotion to Ligue 1 alongside the champions Bastia. Both clubs achieved promotion with one game to spare following league victories on 11 May 2012, which positioned each club in second and third place permanently. Reims, which is a six-time Ligue 1 champion, will be returning to the first division after over 33 years playing in the lower divisions. During those 33 years, the club underwent liquidation and had all aspects of the club (its records, trophies, etc.) auctioned off. Troyes will be returning to Ligue 1 after a four-year stint in Ligue 2. There were three promoted teams from the Championnat National, the third division of French football, replacing the three teams that were relegated from Ligue 2 following the 2010–11 season. A total of 20 teams competed in the league with three clubs suffering relegation to the Championnat National. All clubs that secured Ligue 2 status for the season were subject to approval by the DNCG before becoming eligible to participate. Arles-Avignon was the first club to suffer relegation from the first division to Ligue 2. The club's impending drop occurred on 17 April 2011 following the team's 2–0 defeat to AS Monaco. The negative result made it mathematically impossible for Arles to seize the 17th position in the table, which would have allowed the club to remain in Ligue 1. Arles-Avignon made its return to Ligue 2 after only a year's spell in the top division of French football. On 15 May, Lens were relegated from the first division to Ligue 2 after its 1–1 draw with Monaco. Lens returned to Ligue 2 for the first time since the 2008–09 season when the club finished as champions of the league. On the final day of the Ligue 1 season, Monaco suffered relegation to the second division after losing 2–0 to Lyon. The club's appearance in Ligue 2 was its first since 1976. Bastia became the first team to achieve promotion to Ligue 2 from the Championnat National after drawing 1–1 with Fréjus Saint-Raphaël on 22 April. Coupled with fourth-place Strasbourg's draw with Luzenac on the same day, the results made it mathematically impossible for the Alsatians to catch Bastia in the standings. Amiens achieved promotion from National to Ligue 2 on 13 May following its 2–1 home win against Guingamp. Amiens made its return to the second division after spending two seasons in the Championnat National. Guingamp became the final club to earn promotion to National after its 2–0 away win over Rouen. Similar to Bastia, Guingamp made its return to Ligue 2 after only one season in the third division. On 1 July 2011, following a preliminary review of each club's administrative and financial accounts in Ligue 2, the DNCG ruled that Tours would be relegated to the Championnat National. Tours president, Frédéric Sebag, confirmed the demotion was as a result of the club's failure to "balance its books". Sebag also confirmed that the club would be appealing the ruling. On 13 July, Tours successfully appealed to the DNCG and was subsequently reinstated into Ligue 2. Note: Flags indicate national team as has been defined under FIFA eligibility rules. Players and managers may hold more than one non-FIFA nationality. 1Subject to change during the season. (C) Champion; (P) Promoted; (R) Relegated. The nominees for the UNFP Ligue 2 Player of the Year award was awarded to Bastia midfielder Jérôme Rothen. The UNFP Goalkeeper of the Year award was awarded to Macedo Novaes of Bastia. The UNFP Manager of the Year award went to Frédéric Hantz of Bastia. 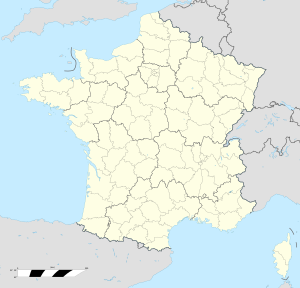 ^ "Nantes v. Amiens Report". Ligue de Football Professionnel (in French). 27 April 2012. Retrieved 27 April 2012. ^ "Arles-Avignon v. Istres Match Report". Ligue de Football Professionnel (in French). 20 December 2011. Retrieved 20 December 2011. ^ "Metz v. Guingamp Report". Ligue de Football Professionnel (in French). 4 May 2012. Retrieved 4 May 2012. ^ "Lens v. Châteauroux Report". Ligue de Football Professionnel (in French). 20 December 2011. Archived from the original on 5 August 2012. Retrieved 2 March 2012. ^ "Istres v. Châteauroux Report". Ligue de Football Professionnel (in French). 20 September 2011. Retrieved 26 September 2011. ^ a b "Affluences". Ligue de Football Professionnel (in French). Retrieved 11 August 2011. ^ "Palmarès: Les champions de France depuis 1934/1935". Ligue de Football Professionnel (in French). Archived from the original on 19 April 2011. Retrieved 23 April 2011. ^ "Le calendrier dévoilé le 10 juin". L'Equipe (in French). 30 May 2011. Archived from the original on 2 June 2011. Retrieved 30 May 2011. ^ "Les calendriers 2011/2012". Ligue de Football Professionnel (in French). 10 June 2011. Archived from the original on 19 January 2012. Retrieved 21 June 2011. ^ "Le calendrier général 2011-2012 validé" (PDF). Ligue de Football Professionnel (in French). 31 March 2011. Archived from the original (PDF) on 23 August 2011. Retrieved 22 April 2011. ^ "Le SC Bastia champion!". Ligue de Football Professionnel (in French). 1 May 2012. Retrieved 1 May 2012. ^ "Bastia, sept ans de réflexion..." National Union of Professional Footballers (in French). 2 May 2012. Archived from the original on 28 December 2012. Retrieved 2 May 2012. ^ "Football: Troyes et Reims promus en Ligue 1". 20 Minutes (in French). 11 May 2012. Retrieved 11 May 2012. ^ "Football: Reims et Troyes promus en Ligue 1". Le Monde (in French). 11 May 2012. Retrieved 11 May 2012. ^ "Troyes une montée en Ligue 1 qui a surpris tout le monde". Voila (in French). 11 May 2012. Retrieved 11 May 2012. ^ The DNCG is responsible for overseeing the legal and financial accounts of professional football clubs in France. If clubs operating in French football don't meet the DNCG's expectations, they can face sanctions, such as relegation. ^ "Marseille lâche prise, Lens relégué en L2" (in French). 20 Minutes. 15 May 2011. Retrieved 17 May 2011. ^ "Monaco relégué en L2" (in French). Eurosport. 29 May 2011. Archived from the original on 1 June 2011. Retrieved 29 May 2011. ^ "Bastia en Ligue 2!" (in French). French Football Federation. 23 April 2011. Archived from the original on 26 April 2011. Retrieved 23 April 2011. ^ "Bastia retrouve la Ligue 2" (in French). L'Equipe. 22 April 2011. Archived from the original on 26 April 2011. Retrieved 22 April 2011. ^ "Amiens retrouve la L2" (in French). Eurosport. 13 May 2011. Archived from the original on 16 May 2011. Retrieved 17 May 2011. ^ "Guingamp est de retour en Ligue 2!" (in French). Ouest-France. 27 May 2011. Retrieved 27 May 2011. ^ "Tours, relégué, va faire appel" (in French). L'Equipe. 1 July 2011. Archived from the original on 3 July 2011. Retrieved 1 July 2011. ^ "Tours va faire appel" (in French). Eurosport. 1 July 2011. Archived from the original on 29 July 2011. Retrieved 1 July 2011. ^ "L2: Tours réintégré" (in French). Sport365. 13 July 2011. Retrieved 13 July 2011. ^ "Guyot, nouvel entraîneur du CSSA" (in French). L'Union. 26 May 2011. Retrieved 26 May 2011. ^ "Garcia appointed Lens coach" (in French). Fédération Internationale de Football Association. 1 June 2011. Retrieved 1 June 2011. ^ "Stéphane Moulin nouvel entraîneur" (in French). L'Union. 1 June 2011. Retrieved 3 June 2011. ^ "Stéphane Moulin nouvel entraîneur" (in French). Sport.fr. 2 June 2011. Archived from the original on 14 March 2012. Retrieved 2 June 2011. ^ "D. Sanchez au VAFC pour 2 ans" (in French). Valenciennes FC. 8 June 2011. Retrieved 8 June 2011. ^ "Le TFC choisit Ziedler" (in French). La Nouvelle République. 14 June 2011. Retrieved 14 June 2011. ^ "Communiqué de presse" (in French). Valenciennes FC. 12 September 2011. Archived from the original on 17 October 2011. Retrieved 12 September 2011. ^ "Simone remplace Banide" (in French). L'Equipe. 12 September 2011. Archived from the original on 22 December 2011. Retrieved 12 September 2011. ^ "Arles-Avignon: Hadzibegic limogé" (in French). Le Figaro. 23 November 2011. Retrieved 29 November 2011. ^ "Arles-Avignon: Laurey succède à Hadzibegic" (in French). Sport France TV. 28 November 2011. Retrieved 29 November 2011. ^ "Le Mans limoge Cormier" (in French). Le Figaro. 22 December 2011. Retrieved 22 December 2011. ^ "Le Mans privilégie la solution interne" (in French). Sports.fr. 28 December 2011. Retrieved 28 December 2011. ^ AS Monaco will still maintain 33% of the club representing the interests of the Principality of Monaco. ^ "Russian billionaire Dmitry Rybolovlev completes takeover of Monaco's soccer club". Washington Post. 23 December 2011. Retrieved 23 December 2011. ^ a b c d "Classement du Fair-Play". Ligue de Football Professionnel (in French). Retrieved 11 August 2011. ^ a b c "UNFP: Trophées UNFP du football: Tous les nommés..." (in French). National Union of Professional Footballers. 2 May 2012. Archived from the original on 16 April 2013. Retrieved 2 May 2012. ^ Toufik O. (14 May 2012). "Ghilas et Harek dans l'équipe-type de Ligue 2" (in French). DZfoot. Archived from the original on 15 May 2012. Retrieved 15 May 2012. This page was last edited on 15 April 2019, at 19:20 (UTC).